In this article we’ll show you how to create, send and analyze a classical email campaign in a few minutes. Needless to say, this is eMailChef comes with many more other details and functions: take this step-by-step procedure as an easy introduction to our system, and refer to the full user guidefor all other information. 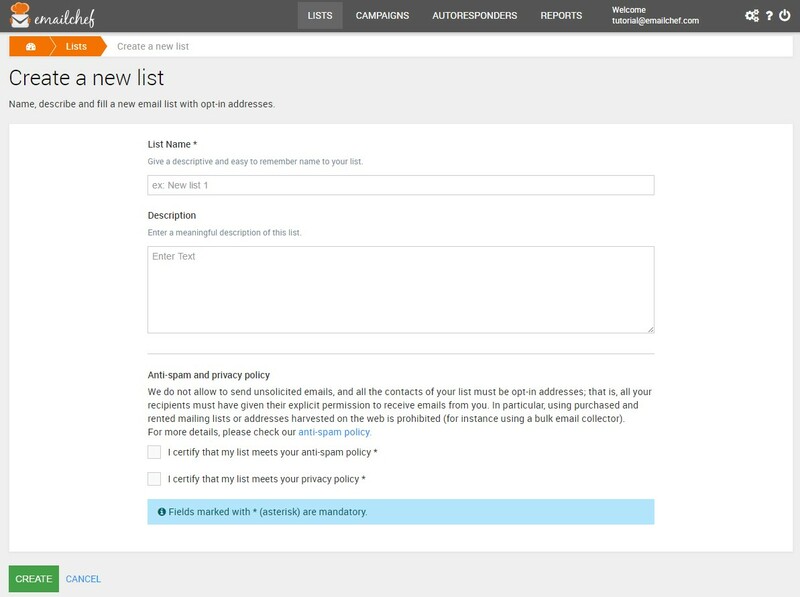 Then give a name and a description to your list, and flag the two boxes below to certify that you’ll be sending emails only to permission-based addresses. That is, to people who have clearly stated their will to receive your newsletters. copy and paste a list of addresses from the Clipboard: each address should be put on a single line. 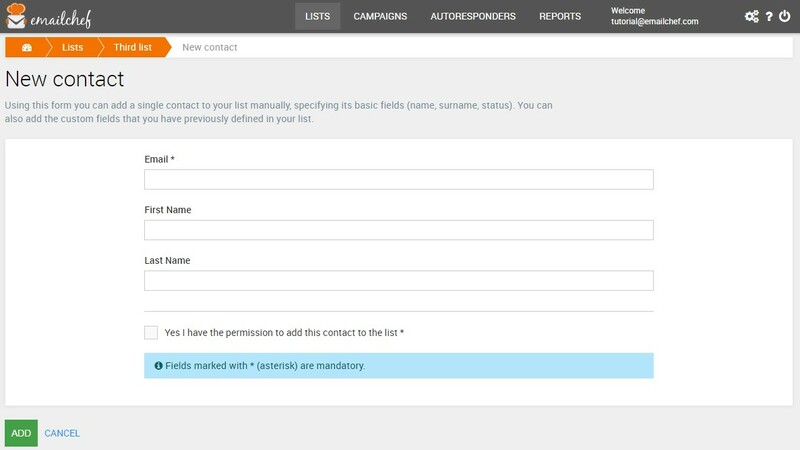 If you want to add other information fields to the contacts, click on “Custom Fields” and create it. eMailChef also provides a dedicated editor to create and embed in your website a sign-up form. It’s still the best way to grow your list and attract new subscribers: for all information about it, refer to the full guide. Okay, now you’re ready to compose your first email! 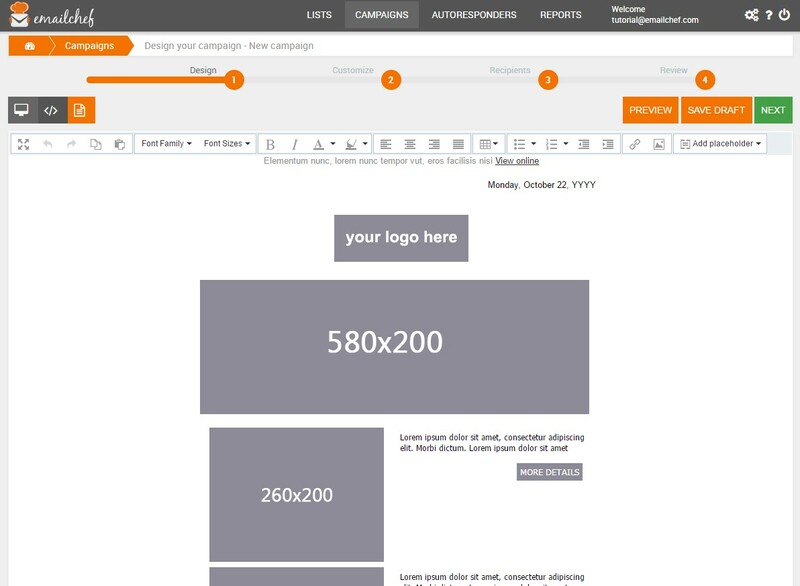 download our professional Template Creator to design your layout with a simple series of drag-and-drops. You can add your content and customize the details as you wish, for instance uploading and placing new images, changing the font type and color, create a bullet list, and of course add external links. 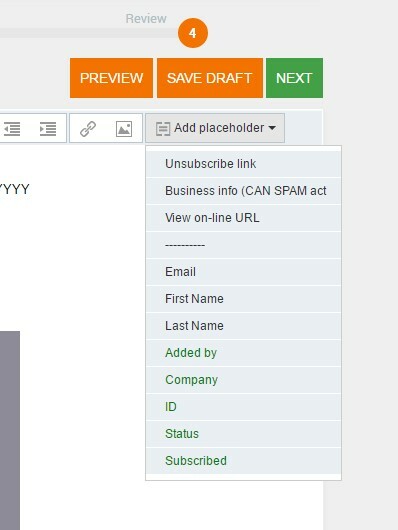 Once you have finished your newsletter, click on “Next” to customize your campaign, and add a name and a subject line, and specify from which sender you want to mail out your message. If you want, you can also add another sender address, or a different address for the users’ replies. and that your recipients will see as the business details of the sender you selected, and a link to cancel their address from your list. Back to your campaign: rememberthat a good subject line should always be less than 50-60 characters and should entice your readers! Now you’re ready to send the email. It’s probably a good idea to run a spam check in order to avoid filtering issues: it’s a quick step that you can run in the Overview screen, clicking on “Spam test”; then it’s all up to you: either you can send your message immediately, or schedule it for a later delivery. Do you think that after having sent a newsletter the work is done? Think again! Now it’s time to check how it went — whether it’s been a success or not. 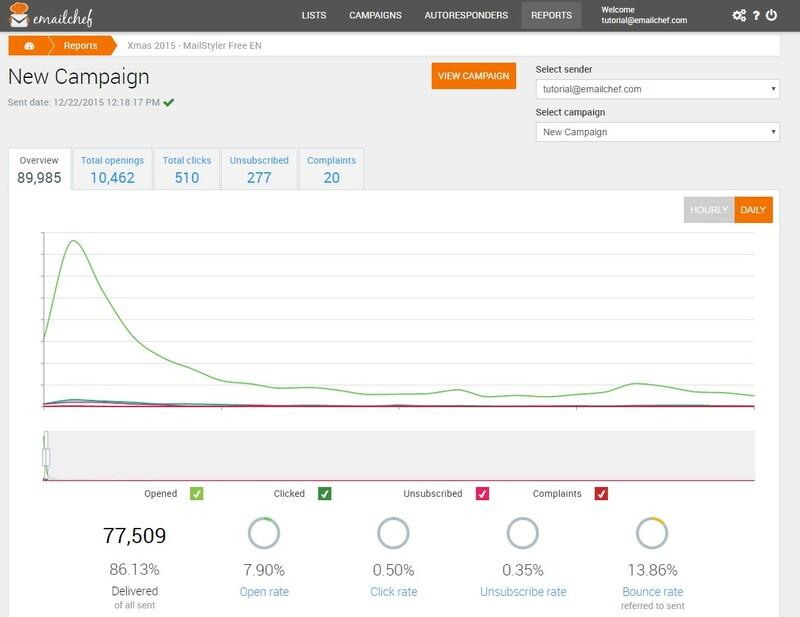 eMailChef provides an accurate analytics tool, updated in real-time, to give you all the most relevant metrics about the interaction between your email and your subscribers. Below, you will also find the complete list of all contacts related to the category (address by address, who has opened the newsletter, who has clicked etc. — complete with the day and time when they performed the action). This metrics are invaluable to improve your campaign. For instance, if you see your open rate dropping, it’s time to rethink your subject line copywriting or change the sending day and time. A high number of bounces, on the contrary, means that you should definitely clean your list erasing doubled or misspelled addresses. And this is pretty much all — again, as a simple overview. 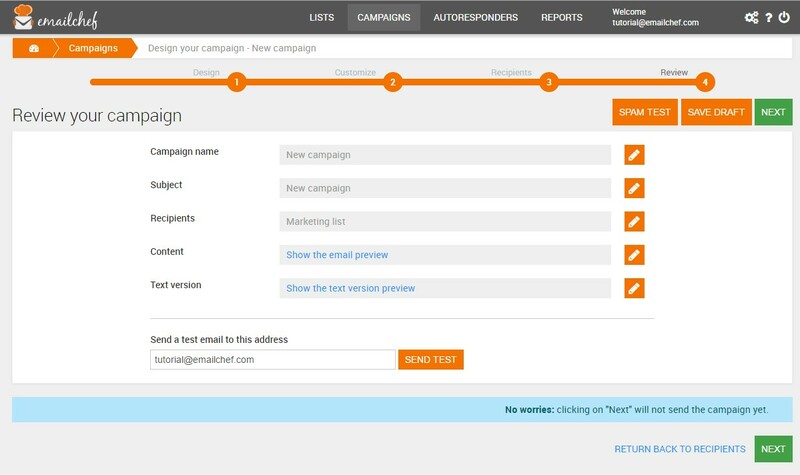 We have showed you how easy and fast is to create, send and analyze an email campaign with eMailChef: but that’s just the first step. If you want to dig deeper into our system, you’re welcome to explore it freely and take advantage of our full user guide if you need. Oh, and remember that we’d be glad to help and know your opinions.